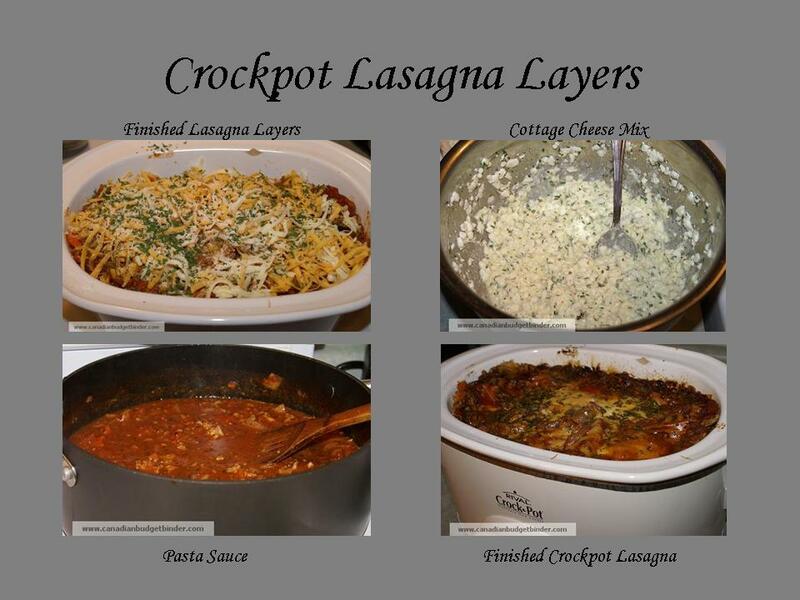 Crock-pot Lasagna, no way, you can’t make lasagna in a crock-pot. I’ve made beef stew, beef chili, chicken, meatballs and sauce and even Easter Dinner in the crockpot but never the mother-load of all baked meals, a lasagna. Crock-pot Crock-pot, come out come out wherever you are. I swear it took off when it overheard me saying I was going to make a lasagna in it. Even the crock-pot had some reservations about this turning out anything like the traditional oven baked Italian lasagna recipe that most people sink their mouths into. That’s what I used to think until I actually gave this a try. I used my typical oven baked lasagna recipe to create this except I didn’t have ricotta on hand so I substituted for cottage cheese to make this dish. So, sit back and enjoy the layers in this one-pot lasagna recipe!! No need to worry about boiling lasagna noodles with this recipe although if you opt to boil them it’s not rocket science. I would get a huge pot and fill it with water until boiling and drop in a few lasagna noodles at a time and cook until al dente (5-7 minutes), remove and use them immediately in your layers. It’s a tedious process and you don’t want to let the noodles hang out for too long. Sometimes I used to add lightly some extra virgin olive oil if I have them on a dish waiting to be used. What are no-boil lasagna noodles? Essentially they are lasagna noodles that you don’t have to run through the process as described above, you can use them as-is. This is your no-bake, no-cook lasagna recipe because you don’t even have to boil the noodles like you would with a traditional lasagna. I bet you were thinking, “how do we make pasta for this recipe”? No, but If I were creative in the kitchen I could have made homemade lasagna noodles but I didn’t have time, besides using the crockpot is meant to save time. Since the no-boil lasagna noodles are readily available many people opt for that instead of boiling the noodles on the stove-top. Some people also don’t fancy the no-boil noodles and would prefer to boil them as they feel the taste is different. You can certainly do that for this recipe buy purchasing the noodles you need to boil or make them yourself. Where to find no-boil lasagna noodles? You can pretty much find the no-bake or no-boil lasagna noodles at any grocery store in Canada and you may also try your luck at a market or speciality shop. There are many brands of noodles but I have used the Primo no-boil lasagna noodles and Barilla no-boil lasagna noodles for my lasagna recipes in the past. I probably had to worry more about convincing the wife than anyone else because she was going to be eating this with me. The top of the finished product looks a bit dark around the edges only because the sauce browned but it made no difference at all to the overall taste. The lasagna was layered with a homemade turkey mince pasta sauce, mozzarella, hard-boiled eggs, mushrooms, a cottage cheese, egg, cream and parsley mix. I used a different sauce for this recipe not as overwhelming with the ingredients as my meatball and pasta sauce but it has the right balance of tomato flavour that helps this lasagna come to life. I made the sauce ahead of time as it does take a couple of hours to reduce to bring out all the flavours. Many people don’t use hard-boiled eggs in their lasagna and hey, I hear you. 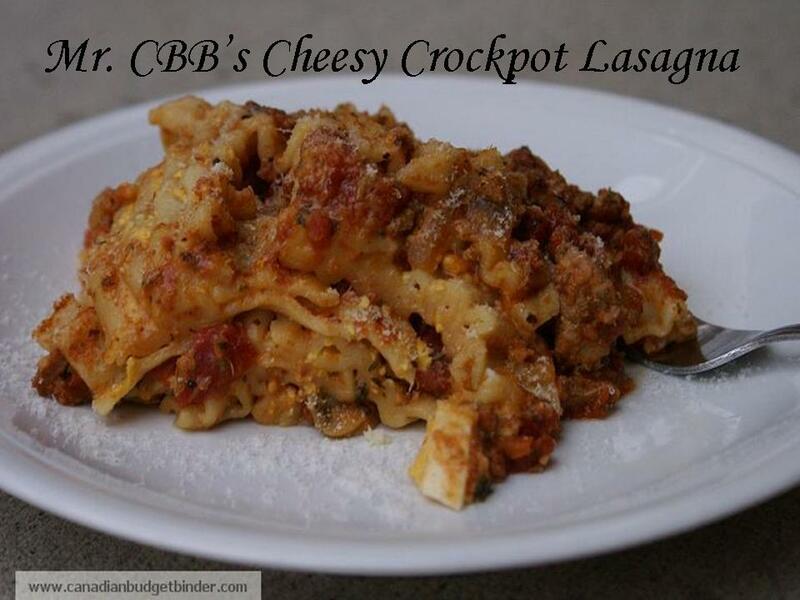 I’m sure many of you are saying, what in the heck is Mr.CBB doing adding hard-boiled egg slices to his crock-pot lasagna for. It wasn’t me, it was the wife who turned me into a believer. I love eggs and I eat them at least 3 times a week if not more. When my wife made her lasagna for me one day and added the eggs I thought she was off her rocker, I really did. She promised me that I would be a new man after trying her lasagna and you guessed it, I was. The eggs adds just the right amount of depth to this lasagna that I’m sure you will wonder why they heck you never thought of that idea yourself. I added lots of sauce to each layer starting with sauce on the bottom. How Do You Make Lasagna? 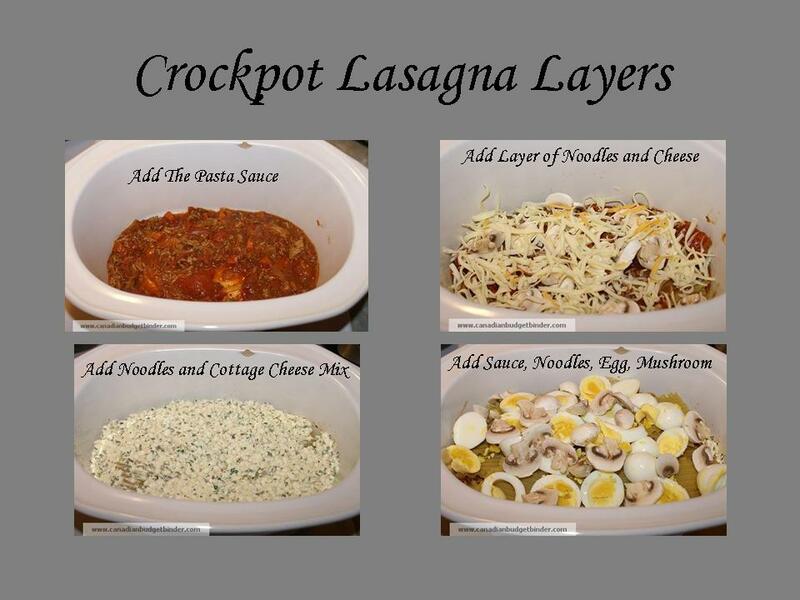 This crock-pot lasagna is no different from making it in a lasagna pan so just follow the instructions if you are using a pan instead of a crock-pot or slow cooker. I organized the photos below layer by layer for you. If you don’t add enough sauce you risk the lasagna drying up on you just like anything else you put in the crock-pot that doesn’t produce a liquid from the steam. You will find the no-boil noodles will want to soak up the sauce in order to soften each layer so don’t be shy with the pasta sauce, layer it on thick. I started with a layer of sauce on the bottom, then added a layer of noodles, then sauce, cheese, noodles, cottage cheese mix, cheese, sauce, noodles, egg, mushrooms, cheese, sauce, noodles, sauce and top it with lots of grated mozzarella and Parmigiano-Reggiano. You will find a variation in some ingredients depending on how big your crock-pot is. You can also layer the lasagna however you like but I like to try and keep the ricotta cheese filling near the middle. I also tossed parsley flakes on the top for good luck. If you let the lasagna set a bit after you shut it off it may help to cut it a bit but since it’s not in a traditional pan you may not get the perfect piece of lasagna. It’s more a rustic lasagna, so tuck in and enjoy. Time: Cook on low for about 4-5 hours or until the noodles are tender. I just use a fork to check! In a large pot add your olive oil and heat up, then add in your onions and garlic and sauté for 2-3 minutes. Add in your turkey mince and cook until browned. Add in your tomato paste and rinse out the can by adding some water and tossing that in the pot. In a bowl add your ricotta or cottage cheese, egg, cream, 1/4 cup Parmigiano-Reggiano, parsley, salt and pepper and stir that’s it. Enjoy this crock-pot lasagna with your favourite crusty bread, garden salad and a beverage. Finish it off with a fudgy brownie and this is a meal that is perfect for any night of the week. Discussion: What are your favourite lasagna layers? The Saturday Weekly Review #17- All Mouth And No Trousers! Looks delicious, as usual. The hard-boiled eggs threw me for a loop and I had to reread the sentence to make sure I didn’t misunderstand! Of course, now I’m simply intrigued by the idea. 🙂 I haven’t made lasagna in a crockpot before but I like the convenience factor. What size crockpot do you use? 6 quart? I use a big crockpot I think it’s 8 quart… the hard boiled eggs are awesome in it.. try it and let me know what you think. I don’t have a 8 quart, but I would just smush into my 6 quart. 🙂 Looks great. Can’t wait to try it. That looks yummy! We would use eggplant or soy beef crumbles instead of meat, but it looks great! What are soy beef crumbles? Are you both vegetarian? Oh the eggs are great inside the lasagna. I never thought I would like them but they are perfectly fine. cheese + crockpot + lasagna! Whoah, talk about the trifecta of awesomeness. Ummmm Mrs, 1500, I have a new recipe for you to try. Right now! What I like about this recipe is we don’t have to baby sit and it cooks all day. It’s perfect! I wish it was that way with my kids, except for the cooking part. I would have never believed you could do that in the crock pot. We love lasagna. I don’t think I could do the eggs, but I bet you could add any type of veggies and it would be good. You can use ricotta… what do you put in your lasagna if you don’t use a cheese layer? I have used the mushrooms right in the sauce which you could easily do. I find when I layer them they stay firmer in the cooking process and don’t break down as much which gives a meatier bite. I do remember the oven baking eggs but would have to google it….